Leaving the wilderness home of the Crystal Creek Pack had had its benefits. Returning to our home (away from home) meant heat, running water, and a phone nearby. The Lake Village rangers had made us feel most comfortable and welcome, but it looked as if we were about to forego this fine hospitality for what would be the remainder of our expedition. The time had come to pursue these wolves in their home. As we hurriedly packed food and supplies into the sleds, I thought how nice it was to have eaten much of the food I would have otherwise packed into Pelican Valley earlier on. Happily ensconced in our tiny apartment, Dan and I had busied ourselves with the job at hand (Chapter 2), unencumbered with the severity of snow camping. We had grown accustomed to a dawn-to-dusk work day that was exhausting, I will admit, but that had been lubricated by the heat, light, and comforts of civilization each evening and morning. No days began with wet boots, no evenings ended without a call home. Even the daily rides on snowmobiles that Dan had begun to call, "the pigs," had become routine, even fun--I hate to admit. Oh, and the river otters at the bridge, playing among the many portals of their cornice castle, would certainly be missed. Had there not been a more pressing mission for our return to Pelican Valley, I would have found it difficult to extract myself from these pleasant surroundings. But our departure route lied on the fresh trail of the Crystal Creek Pack, and no better time had presented itself for our purposes. It was time to go, and as we paid breathless attention to the details of our preparation, we felt excitement. Our first sighting could come that day. Once ready, and only minutes after our departure, I was recalling the breathless feeling I had felt on our initial foray into the valley (Chapter 1). Coupled with an initial fatigue, I was finding my pack was not compatible with my sled harness, and so was I forced into major rearrangements in the early-going. The sun, arcing high with the coming of spring, began to bake the heavy snow pack upon which I skied, further slowing progress. Dan had a quarter mile on me by 11:00 a.m., but I could still see him ahead, working his way up through a long, flat meadow. Before coming to the valley, we were contacted on the radio by a ranger patrol. They were en route to a remote cabin on the east side of Pelican. Their news was good: they had spotted the pack, 14 members in sight, resting atop a high bank on the west end. Their location was just east of another set of thermals, Vermillion Springs, through which they must have passed, testing any bison they encountered as was their manner. With the new information I updated the map of their travel route in my mind. It appeared as a series of lines connecting certain points along a zig-zag course across the landscape. The dots were the thermal areas, winter refuge for the weary bison. The lines were the tracks of fifteen wolves, moving in force. Nearing the valley we crossed this line of tracks, unmistakably a large pack with most members having left a gallop pattern across the open meadow we were traversing. The wolves were cutting through the meadow, from edge to edge, their tracks heading toward Vermillion Springs, as expected. We were not far behind. The growing anticipation for our first sighting of the pack fueled our way through periods of heavy fatigue. The wet snow clung to the bottom of the sleds. Sweat poured off of my brow as the suns rays became increasingly intense. When finally we arrived at our first vantage point in the valley I felt that it was as far as I was going to go. As we parked our sleds in the trees and rummaged through the gear to find binoculars and the receiver, I was desperately hoping the pack would be where the rangers had seen them, for in my current state I felt I could not endure going further. If they were there, we could dig in and take our watch from this point. Faint signals and only a few quiet bison scattered around suggested the wolves had vacated the area. By the nature of the signals they seemed to be traveling, and their heading was northeast, or further into the valley. They would not be seen within the trees that lined the valleys perimeter. It was a disappointment to us to have not caught our first glimpse of the wolves. It was nearing the half-way point on my leg of the Pelican Valley Expedition and a "visual" alluded us still. Furthermore, this movement by the pack meant we would have to follow, to keep pace in order to keep alive the possibility of future observations. In the interim, we would struggle with our loads across the vast, snowbound floor of the valley. We rested briefly and were soon underway. Our route took us down to Pelican Creek, the meandering backbone of the valley. There the greatness of this wilderness began to make its impact upon me. The vast white sheet that covered the floor gave way to wooded hills that in turn grew to distant peaks. Several of them loomed large over the valley: Mt. Chittenden, Pyramid and Cathedral Peaks-- all over-loaded with globs of snow and ice like the confectioners sugar on a wedding cake, but taken too far. Below them in the bottomlands, bison excavations--tiny forage mines that sustain the shaggy behemoths through the winter--dotted the landscape. We picked our way through them, often electing to go to deeper snow where the wind had blown it bare and flat. Small groups of bison and single bulls dotted the wind-blown side-hills while larger herds concentrated on the riparian zones and melted-out thermal areas along the creek. By the time the evening sun hit the horizon we had come several miles up the valley. We stayed to the opposite side of the valley from the pack, wishing to keep up with them, but not to bump into them. By coincidence their route had taken us closer to our destination, a large hill on the margin of the valley we had scouted the previous summer. The hill, an optimal observation site, offered a commanding view of the valley while being just out-of-the-way enough to keep us out of the packs path. In my delirium at that end of the day, aching and tired, I gazed at this hill wishing we were already there. It seemed optimal at that very moment for observations of the Crystal Creek Pack. 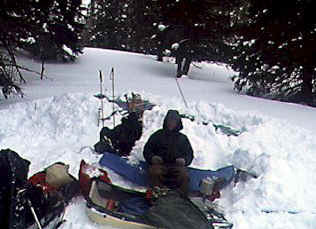 That night we dug in, constructing snow shelters with our shovels that were in the end, snug and warm. Our camps were comfortable--despite the lack of amenities. Note the snow shelters covered with tarps dug behind where Dan is seated. Signals taken at dawn the next day suggested the pack had gone up a side drainage and further away. It seemed we were falling behind, our goal slipping away. But it was a good opportunity to cross the valley and gain the summit of our observation hill. So quickly we set off, my aches awakening with an initial retrace of our previous days route to the creek. We crossed the creek and were sprinting over the frozen surface of the snow to get to the cover of the valleys far side. As we approached, the hill towering before us became an increasingly foreboding prospect. A worthy destination, though not easy to achieve. On the flats I thought back to a recent National Geographic article written by a popular adventure writer, Jon Krakauer. Recently, he accompanied a team whose goal it was to climb a sharp, granite slab in Antarctica known as Rakekniven, or "the razor." He skied for miles across vast, frozen flats with the peak always just ahead. With the flats of Pelican Valley seeming like the endless ice of Antarctica, my Rakekniven shot up before me, prominent in my adventure in the same dreamy, exhilarating manner as the original met with Krakauer. At the base of the hill we quickly discovered the sleds that were gliding so well across the frozen flats that morning would not be easily hauled up the steep grades that stood between us and the top. With that realization, we decided two trips apiece were necessary, each with half our respective loads. With an unexpected second wind, I forced the first route up the hill happy to trade the sled harness for the more familiar backpack. At the top I discovered a wonderland I had not imagined. The previous summer we had come to this spot and taken in a spectacular view, which was still grand, though more timelessly portrayed in the winter shades of gray. The ancient trees that grew on the windy ridge of the summit created a myriad of drifting snow accumulations coming to a crest at the east edge of the summit in the form of a massive cornice. On the lee-side the wind vanished and I found massive stores of snow with only a few burnt snags protruding through. This was a wonderland, indeed, and I fancied a camp would be well-placed in this sheltered location. After our final loads up the steep track we rested, then began to plan our camp with a renewed energy of having attained our destination. The summit area was too windy for a camp, but below its mighty cornice it was unusually calm. The views below the cornice were not complete, necessitating the placement of viewing decks in all directions not visible. But for the decks to be functional and convenient they needed to be connected with short and improved routes. Our camp would be ideal only if we had shelter from the elements, ample snow for "digging in," as well as, quick and convenient access to viewing areas. To this end, we created the Grand Staircase. Knocking straight through the large cornice, we constructed a steep but effective set of stairs linking our camp to the optimal viewing deck at the summit. The layers of snow in the profile of the steep cornice calved away leaving perfect steps, one after another. On top, we could check signals or scope the vast valley below within seconds of our encampment. The ease with which we could go between these two critical areas facilitated regular checks and optimized our viewing effort. We dug two snow shelters to lodge our clothes and sleeping gear. Nearby we engineered a kitchen area with seats, counters, and "drive-through" decks for our sleds. The creative process and resulting comfort that made our camp, "Camp Crystal," into what it was has endeared me to winter camping like no other experience. Before I would have preferred a cabin for the long, cold nights of winter. After this experience, I prefer to dig in and design a custom camp to my own specifications. From the observation decks we monitored the radio signals of the pack continuously. They had gone up a drainage to a large basin of hills and thermal areas. Searching this area with our spotting scopes, we found only the bison that made the area attractive to wolves. At one large clearing we found a herd of a dozen animals which included at least two calves! I had thought the areas were able to sustain a few bison, mainly bulls, but calves in these remote island sanctuaries surprised me. Nights in camp were cold and quiet. We busied ourselves with food preparation and safe storage, being especially meticulous out of respect for bears coming out of hibernation. Time allowed continual improvements to our kitchen, shelters, and a few weak steps in the Grand Staircase. What seemed like hours would comfortably pass without a word spoken. I reached for my water bottle, took a drink, and while replacing the cap sucked the water from the threads so the cap would not freeze tight. "Good technique," Dan whispered. We both erupted with laughter. With an insatiable hunger for oils and fat, an unquenchable thirst for tea and cocoa, and a constant battle to keep our fingertips warm, the hours sped by each evening. Night skies were clear as glass with millions of stars twinkling overhead casting their captivating spell over us until our return to the snow shelters and subsequent emergence with the first hint of light in the eastern sky. We were thrilled to start each day. Our situation had become so gratifying that we carried ourselves with a subdued jubilance through every moment of these fine hours. The Crystal Creek Pack, yet to be seen, remained in the sulfur-clouded hills beyond our camp. Resounding signals emanated from a creek dissecting the region. Our first look over the area revealed the same bison, some looking ragged, others appearing outright defensive. Perhaps the wolves had come through. Still with our scopes, we discovered tracks across the distant landscape that appeared to be that of wolves. By mid-morning the pack seemed to be inactive at the creek area. Watching there, we noticed ravens and other birds coming and going. An eagle was perched in a nearby tree. By all indications, a kill had been made. With the discovery of the kill we kept a day-long vigil of the area. We saw no wolves, but to our surprise an enormous grizzly bear emerged from the creek bottom, the approximate location of the carcass, and crossed a meadow before disappearing into some trees. With tingling anticipation we watched for the Crystal wolves to react to this brute, hopefully in an area we could watch the duel unfold. No altercation came about, at least one that was visible to us. At this point, we began to get frustrated. Much of the luster of the expedition was in danger of tarnishing if our experience did not reach the next level. Through much toil, we had put ourselves within striking distance of our objective of observing this pack. Yet, for days they would not appear. If they left this kill area for much of the surrounding forest, we would be out of luck. With our time and supplies running thin, the eleventh hour was approaching. As it was only my leg of the expedition that would soon end, I had to come to grips with leaving without this goal achieved. Dan would return later this month to try again, but I did not know if I would ever return. My sense of it was that we had interacted, in a sense, with this pack, we had learned a great deal, and had had an amazing adventure for our trouble. Tarnish or not, it had been great. The building anticipation in our situation manifested itself in a simple choice made that night when we called in on the park radio. "Are you coming out as planned?" the ranger monitoring our expedition had asked. "Depends on the wolves," Dan answered. We both had come too far. There was no leaving with any possibility of an observation in the coming days. We were dug in, and not about to abandon the hope of realizing our goal.